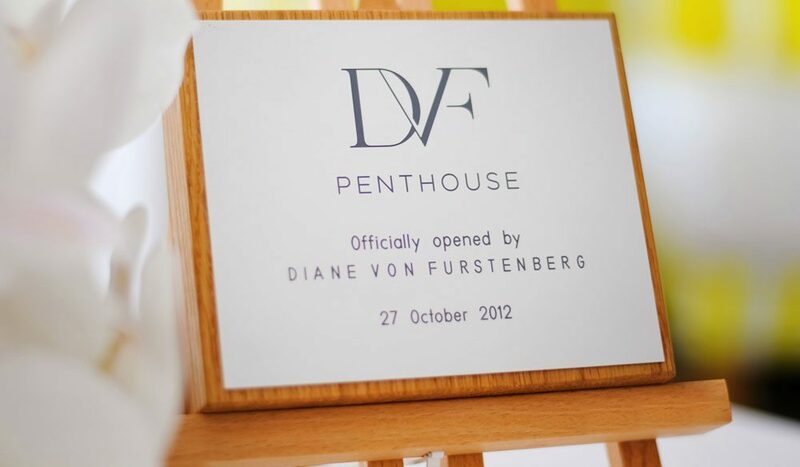 She was just 22 years old when she unveiled her first design, but even then Diane Von Furstenberg had an unusual flair for creativity. Her wrap dress would go on to impact millions upon millions of wardrobes, sparking an entirely new fashion silhouette and revolutionising the way women dressed. Since then, ‘the most marketable woman since Coco Chanel’ has flitted from strength to fashion strength; launching clothing, homewares and fragrance labels, establishing stockists in over 70 countries, accepting a Lifetime Achievement Award from the Council of Fashion Designers of America (of which she later became president) and – arguably the greatest achievement of all – receiving a reference in a Dolly Parton song. As for the iconic dress that started it all; it’s now an official part of the Costume Institute of the Metropolitan Museum of Art collection. 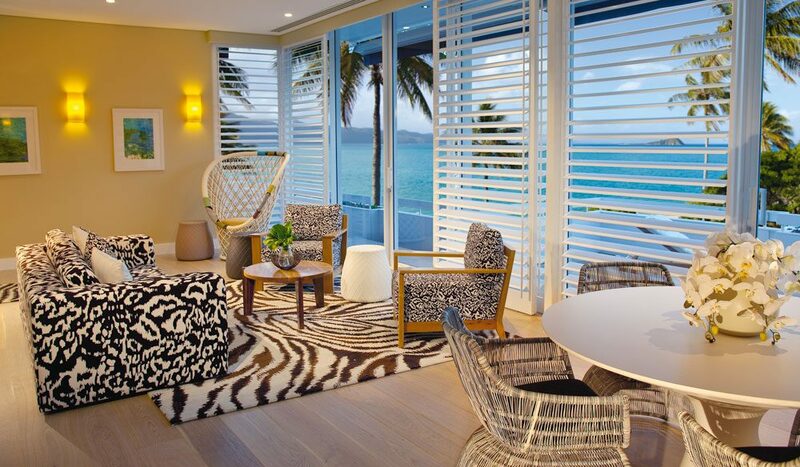 Now Von Furstenberg has turned her hand to travel, collaborating with Hayman Island on the design of her namesake penthouse, which she recently unveiled on 27 October this year. Since her first visit to the country 31 years ago, Von Furstenberg has held a soft spot for Australia (“It’s exotic, but still accessible… like my designs”); which has deepened since her collaboration with Hayman. Originally intending to spend just two days here on this trip, Von Furstenberg cleared her week on arrival, to spend a total of seven nights in one of their beachfront villas. 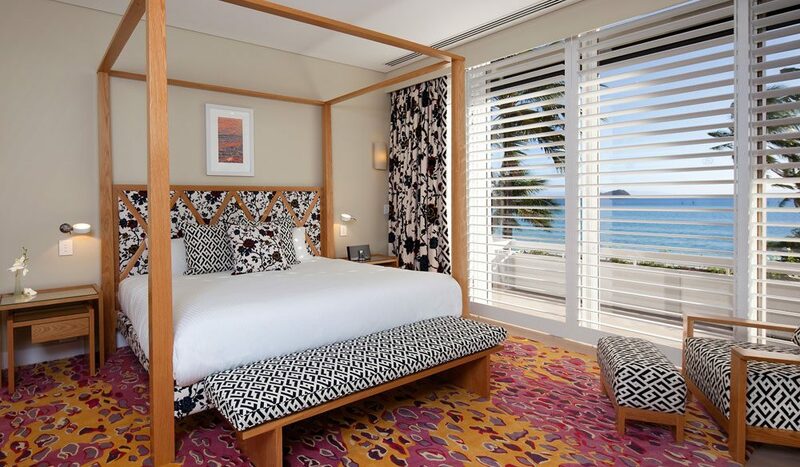 “The serenity… the beauty… the colours… the luxury… it is such a special place,” she says. There are several similarities between this and the longevity of Hayman, she continues. “It’s one of those classic resorts that has been around for years, and at the same time it’s also reinventing itself; making itself relevant, particularly to the contemporary luxury traveller. 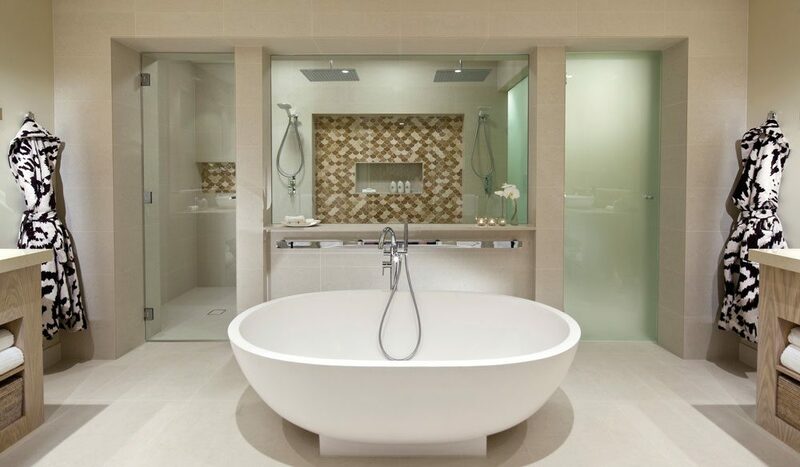 Indeed, this is not Von Furstenberg’s first foray into hotels – in 2010 she designed 20 suites for Mayfair luxury hotel Claridges – but ‘uniqueness’ is the key phrase here. 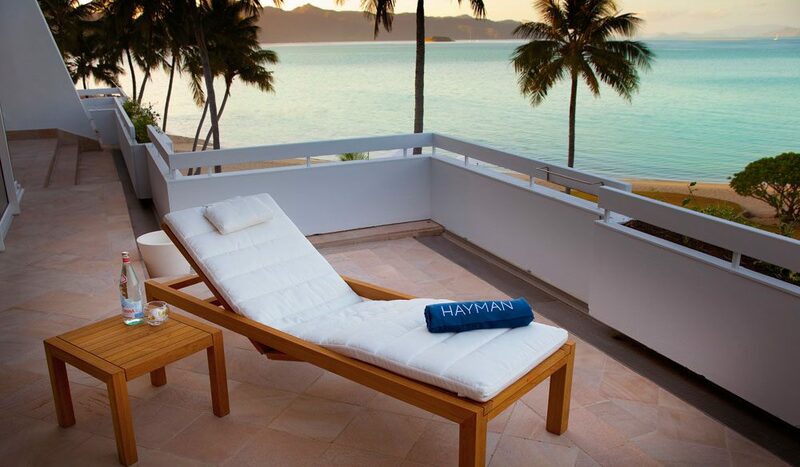 In typical Hayman style, nothing but a discreet placard announces the penthouse itself. Stepping inside, however, is like a trip to the Hamptons home of an eccentric aunt. Giant white shutters, ivory walls and bleached European Oak floorboards in wide-board timber provide an airy backdrop for Von Furstenberg’s iconic prints, including her cult chain fabric, which adorns the corner couches in a swirl of dark chocolate, purple and white. The main bedroom is dominated by graphics, including a romantic rose motif and a signature leopard-inspired rug in blush pink, crimson, purple and mustard. 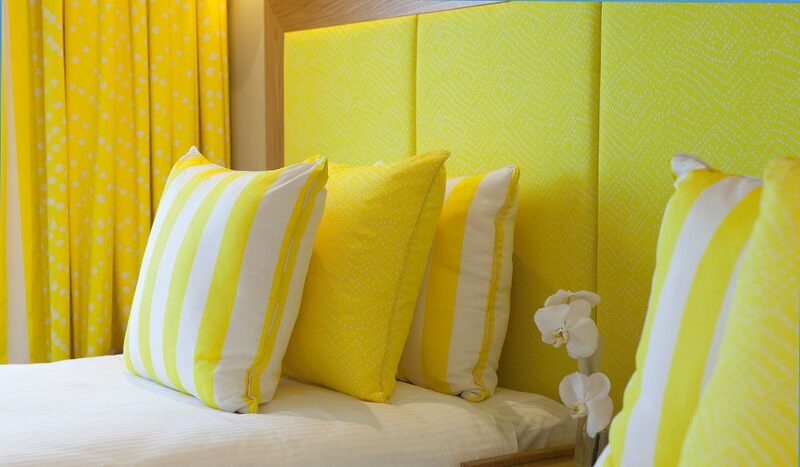 At the other end of the penthouse, punchy citrus yellow punctuates the twin-room in cushions, on curtains and along a traffic-stopping headboard. It’s a daring colour palette, undeniably; but the execution is seamless. “When I initially saw the colour palette and some of the artist’s impressions I thought, ‘how are all those colours and textures actually going to come together?’” admits Guillan. Von Furstenberg’s jetsetter lifestyle has had a clear impact on her aesthetic, too. Each room of the penthouse showcases a collection of photographs from her recent travels about the world, including aquamarine and white fishing nets from a trip to Palma in 2006, a lone bird in Borneo (2009), a cloudy day in the Maldives (2009) and a single photo of her, looking quietly serene as she reclines on a yacht. One certainly doesn’t need to pack much for a spell here. The $5,000-a-night suite, which sleeps four, comes with all meals, an in-room bar and a personal butler for the length of your stay.